CO2 Surgical laser System is featured by reasonable construction, stable performance, safety, and reliability. The CO2 surgical laser therapy apparatus model is suitable for used used extensively in such department as dermatological, ENT, gynecological and general surgical for cut, cautery, and vaporization treatment. CO2 Surgical laser posses Ultra pulse function which the laser can reduce hot damage around the target organ and the output time is extremely short(1ms). This machine has a blowing function, which around the target organ can be cooled at the interval time of pulse. The interval time of ultra pulse is adjustable and control the depth of laser act so as to fit different laser surgery. CO2 laser treatment using sealed-off co2 laser, wavelength 10600nm, the output invisible infrared laser beam is characterized by small , high energy density. Laser beam output by the focusing mirror , the focal point of the target tissue can produce high temperature gasification ,can be used for cutting, burning. Direct the laser beam, low energy density, can be the target tissue coagulation surgery. 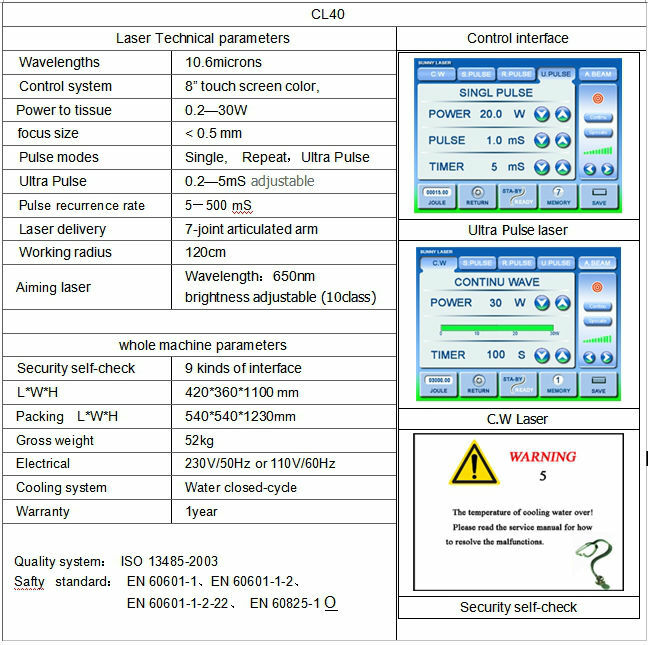 CO2 laser output of the laser transmission through optical arm, with a variety of headpiece, for a variety of surgery. CO2 laser divergence Angle is small, high energy density, after focusing, it can meet a few kilowatts of power per square centimeter.It can be used to lesions of vaporization, burning or cutting lesions in medical field.So CO2 laser therapeutic apparatus also called laser knife.And without the focus of the original beam to focal organization, can produce effect of solidification.Infrared CO2 laser wavelength is 10.6 um, the laser can permeate deep tissue.After expanded beam irradiation to deep tissue ,the laser can do heating therapy treatment. Treatment superiority: CO2 laser therapeutic apparatus adopts advanced CO2 laser treatment technique, safe and effective treatment, to treat your skin soft, no burning stabbing pain, acupuncture or divest discomfort, such as swelling phenomenon, postoperative treatment of the whole zero infection. Cutting the extra tissue and remove mole, remove body odor, Facial cosmetology, body freckle, nevus, tumor, wart, skin cancer, the instrument can excise anything superfluous or useless in order to make strong and handsome and to prevent pathological changing. 3. Ophthalmology: Orbit tumor, eyelid, sty, double blood skin. Neck skin numbness, peri-arthritis, peri-arthritis of shoulder, arthritis, and inflammatory lumps, chronic ulcers, vasculitis, peri-arthritis of shoulder, soft tissue contusion, wound infection, use the beam expander exposure. 6.Others: Underarm odor, corn, ulcer.